Haven’t got any plan yet for Christmas? Here’s a suggestion. How about enjoying an immersive Christmas experience at Signature by The Hill? There will be Santa Claus, Santarinas, Christmas Carollers, live music and of course, good food, some which I’ve already tested it out for you! Only available on the 24th and 25th of December 2015, the festive buffet features a salad bar, turkey station, a decadent selection of desserts and a choice of mains, all that for RM168++ per person. For the the mains, you can choose between Spinach and Cheese Ravioli, Chicken Roulade, Beef Tenderloin or Pan Seared Cod. At the preview of the menu, I picked Beef Tenderloin for my main, which is generally a typical choice for most men. It’s served with creamy spinach & buttered prawn. The meat was thick, grilled, medium rare and therefore tender and chewy. I certainly did not regret choosing this, especially after working out, but it wasn’t my favourite among the four mains. I’ve also got to try a bit of the Spinach & Cheese Ravioli served with duck ragout in truffle & porchini sauce, which wasn’t my cup of tea, and the Chicken Roulade stuffed with bell peppers, foie gras & cheese served with truffle mash & cranberry sauce, which I believe would satisfy those who like chicken with a lot of flavours in a bite. My personal favourite among the four mains was actually the one my girlfriend picked, which was the Pan Seared Cod with seafood stew on a bed of nutmeg spinach. I’m hardly a fan of seafood but there’s just so much this one dish has to offer — prawn, mussels, clamp and of course the cod fish with tasty sauce. If you’re a seafood lover, heck even if you’re not, I’d recommend this delicious dish! Yes, the price probably isn’t cheap to most people, but as mentioned, it comes with a complimentary Christmas Cocktail (macadamia syrup, amaretto, red wine and rum), buffet assortment which may include these few tasty dishes that was served at the preview — Homemade Pumpkin Soup (yellow onion, pumpkin, ginger, thyme, carrot), Nicoise Salad (quill egg, red tuna, mix salad, mini french bean) and Fruits Panna Cotta dessert. And also, not forgetting the music and performances in the spirit of the season which it promises. In overall, I think it’s worth the money for a lovely Christmas time in Petaling Jaya. It was my first time dining at this premium gastro-lounge and I absolutely love its romantically classy vibe. 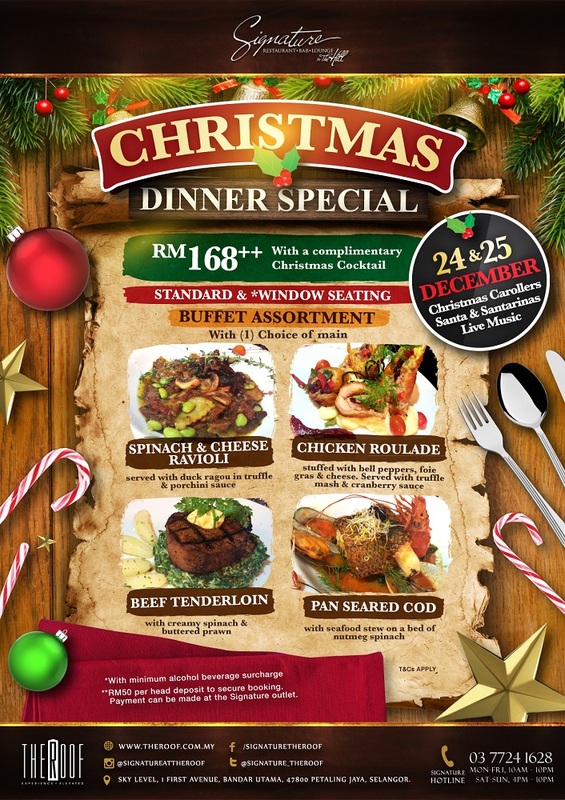 Located on the “Sky Level” of First Avenue (Bandar Utama) where The Roof is with windows as walls all around, patrons can enjoy their Christmas celebration here surrounded by the great view of Petaling Jaya and Kuala Lumpur. For reservations or further inquiries, just grab your phone and call 03-7724 1628 before it’s too late. Only 2 days left till Christmas Eve! Signature by The Hill is not the only one at The Roof with promotions for the holiday season. Visit its website or Facebook Page to check out what else are in store for you!